Manny started out in the watch material business which he took over from his father-in-law in Yorktown Heights and then NY city (Cosmopolitan). He gravitated into collectible pockets with limited knowledge. He attended marts and bought for his monthly watch lists. He ran a mail order business for many years. He was a real promoter with monthly watch and material lists. He had family problems, ran the business into the ground and his wife divorced him. 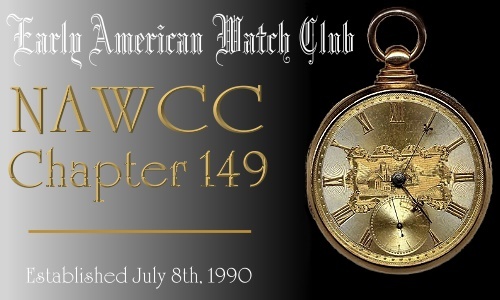 He moved west to Calif and got a new start with Bob Nelch's* widowed wife Liz, and took over Bob's watch and chain collection as a beginning inventory and with his new found money started up again in the antique watch business out of Modesto. Manny was an interesting character and a real hustler. HE offered quite a few better collectible watches and depending on his money situation was easy to deal with as he got older. At the end of a show one could get great bargains from Manny, as he had to pay up for show buys he bought at the beginning of a show. Manny became very overweight, contracted diabetes and became blind. The last time I saw him (sadly) he had to ask me to tell him what he was selling as he couldn't see the watch brand and model, etc.--too bad. Tagline: I met and bought a few watches from Manny in 1971 at the national convention. Last add: Manny imported Swiss staffs, repro dials and copied various catalogues. Some of his "copied" staffs are poorly made and do not fit properly. He carried the Good, the Bad and the Ugly in watches and assoc items. *Bob Nelch originally work for the phone company, collected watches and watch chains, retired and did case repair. He was a fixture at Calif watch shows. What was his focus in pockets?